The texture of this Southern-style dish is more like creamed corn meets quiche than that of dessert pudding. The outer layer is just firm enough so that you can cut into it like a quiche, but it becomes smooth and velvety once you take a bite. It’s so rich and decadent you’ll deny it’s healthy. Contributed by Lindsay S. Nixon, from The Happy Herbivore Cookbook* Note—for holiday meals, like Thanksgiving, this recipe doubles easily. Use two 9-inch pie dishes rather than one large casserole dish. 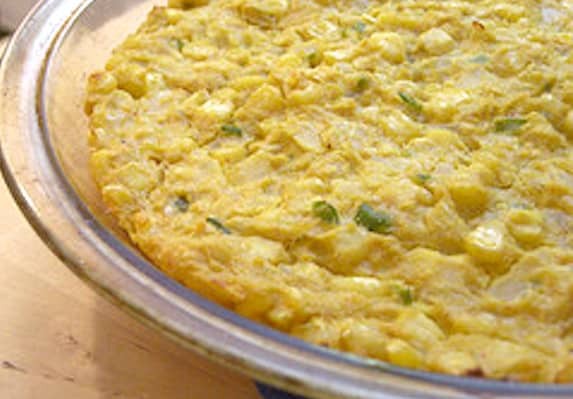 The texture of this Southern-style dish is more like creamed corn meets quiche than that of dessert pudding. The outer layer is just firm enough so that you can cut into it like a quiche. Preheat the oven to 350 degrees F. Lightly oil a shallow 9-inch pie dish and set aside. Combine ¾ cup of corn with tofu and nondairy milk in a blender and pulse until smooth and creamy. Transfer to a large mixing bowl and set aside. Line a large skillet with a thin layer of water and cook onion, jalapeño, and ginger until onion becomes translucent, about 3 minutes. In a mixing bowl, mix all ingredients together until well combined and pour into pie dish. Use a spatula to evenly spread mixture and pack it down tightly. Bake for 30 minutes or until fully cooked and bright yellow. Allow to cool 10 to 15 minutes before serving. Note: Quinoa flour has a nutty and light taste to it that complements corn beautifully, while chickpea flour imparts a nice egg-like taste. However, any flour, including fine cornmeal, can be substituted if you’re in a pinch. Nava: You never cease to inspire me. I made a trial run of this recipe today before Thanksgiving and it is wonderful. I added a little smoked paprika into the batter and sprinkled a little more over the top before baking and it added a nice delicate smoky flavor. I’ll definitely be serving this on Thanksgiving! Thank you! Shari, I’m so glad you enjoyed this recipe, but I must give credit where due — this recipe was contributed to VegKitchen by the talented Lindsay Nixon, AKA The Happy Herbivore. Have a wonderful holiday! Shari, I’m very indecisive and can’t decide between quinoa flour and chickpea flour! Which did you go with for your sucessful trial run? & Did you use the ginger? Thanks! I used chickpea flour. It worked perfectly. And I did use the ginger. YUMMY! Can this be made ahead & frozen? How would you suggest it be done, if it can be done? Monica, I’ll see if I can get this recipe’s author, Lindsay Nixon, to answer your very good question. I want to make this for Thanksgiving and would like to know is this can be made 1.day ahead if time. Someone before asked this question but there was no answer. I do not want to freeze this just make it a day before. Cheryl, this can be made a day ahead of time. Reheat until nice and hot just before serving. Come to think of it, if you’re just making it a day ahead, you cando it just until the point of baking. Refrigerate, and then bake just before serving. I was hoping another reader would answer the question of freezing, as I haven’t tried that. Hope you enjoy this Lindsay Nixon (Happy Herbivore) recipe! I have seen what freezing does to tofu and I would be afraid to freeze this recipe, for that reason. Textures would seem to be important, here. Has anyone ever tried doubling this and making it in a larger pan? I’m thinking of making it for a party with about 45 people coming. Hi Elizabeth — this would probably work, though it’s best if the pan goes broader rather than deeper, so the pudding cooks through. Or, you can splitt it between two similar sized pans. Hope it works out well for you! Just a suggestion… black salt also has an egg like taste to it so that might help! Great idea — I love black salt!